The blog for everyone who wants to survive the Zombie Apocalypse and still pretend to be a gourmet. Startling radio advertisements as well as rumors of a self-described "Sanctuary" have been debunked according to scouts in the Northwest region of Georgia. The message had been broadcasted over and over and was simply stated: "Terminus. Sanctuary for All. Community for All. Those who arrive, survive." Scouts came upon the abandoned train terminal and found the remains of an unfortified shelter, but no survivors. Fire and possible explosives had destroyed most of the facility so no detailed information could be obtained. Impossibly, a portion of what appeared to be human remains had been prepared on large dryers, rendering them into what the scouts believe to be human "jerky." When the gruesome discovery was made, the scout teams quickly retreated from the area. Earlier in the survey and investigation, the scout team had discovered a substantial cache of cases of powdered milk inside the facility. All of the cases were seized and are now being distributed to all survivors in the region. Although the results of the survey and investigation were inconclusive, it can be stated with certainty that the survivors manning the "Terminus" station were armed and dangerous. Any reports of shelter and/or safe zones are likely false. The surviving members of the U.S. Federal Government leadership remain in hiding and no government run shelters exist in the Southeastern part of the United States. 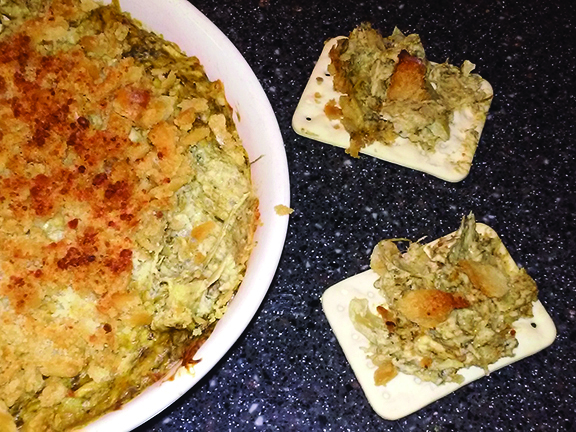 In honor of the fortuitous find of the scouts we present Spinach and Artichoke Dip. Adapted from the USDA's own recipe, this appetizer was developed as a use for government donated milk powder. Garlicky and creamy, your group will never know this delicious appetizer is entirely made from pantry ingredients. Serve with crackers, flatbreads, biscuits or whatever you can scavenge. Preheat oven to 350°F or heat campfire coals to medium-high heat . In a medium-sized mixing bowl combine spinach, artichokes, water chestnuts and mix well. Stir in Cheddar spread, the 1/2 cup Parmesan cheese, Dried Milk, water and all the seasonings. Spread into a 8 inch square baking pan. 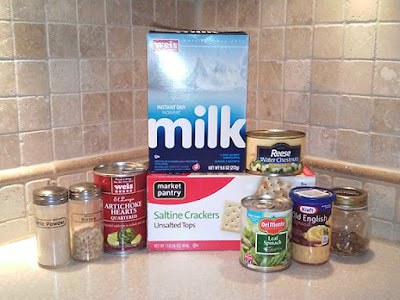 Sprinkle with crushed Saltine crackers and remaining 2 Tbsp. Parmesan Cheese. Cover pan with aluminum foil and bake in preheated oven for 25 minutes or until heated throughout and browned on top. Alternately, cover with foil and place over campfire grill and heat for 35 minutes or until bubbly and browned. There are no more McLunches or Runs for the Border and the only thing left that's Finger Lickin' Good is YOU. We all need to learn to cook together and I'm just the woman for the job.